Millions of people suffer from pain, arthritis and injuries. The standard medical treatment has been to prescribe medications which mask symptoms, giving patients a false sense of relief. Although pain relief is important, ignoring the underlying cause of the pain allows the damage to progress. At our Jupiter Institute of the Healing Arts we believe in treating the root of the problem. Welcome. We treat pain, arthritis and injuries following the guidelines of the National Institutes of Health (NIH), Harvard University and many other renowned Schools of Medicine. The JUPITER INSTITUTE PAIN PROGRAM utilizes a multi-disciplinary approach that combines Medical Care with Chiropractic manipulation, Chinese Accupuncture, Physical Therapy, nutritional guidance and supplements to ensure comprehensive evaluation and patient treatment. The JUPITER INSTITUTE PAIN PROGRAM emphasizes repair. We give patients the freedom to control their healing and the opportunity to be actively involved in their health care. YOU DON’T HAVE TO SUFFER: You don’t have to live with pain or arthritis or with the continued cycle of drugs and their side effects. By treating what is actually causing your condition not only the damage can be reversed, but also your overall health can be improved. 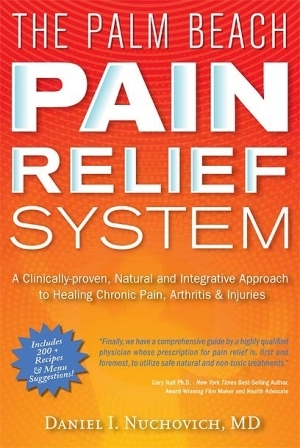 The PB Pain Relief System by Daniel Nuchovich, M.D. 1)INTERNAL MEDICINE: Our program begins with an initial medical evaluation by Daniel Nuchovich, MD, Internal Medicine specialist and Medical Director of the Jupiter Institute of the Healing Arts. In addition to the initial medical evaluation and physical exam, Dr. Nuchovich reviews records and x-rays and work on the diagnosis of each patient. Management and treatment options are then explained and recommended. Dr. Nuchovich coordinates the team treatment , provides a starting course of medications ( when necessary) and monitors the progress and improvement of each patient. 2)PHYSICAL THERAPY: Our physical therapist apply different modalities of treatment to tender and inflamed joints, stimulating the healing process. These modalities improve function while decreasing swelling and pain. Our therapist also instruct patients on different exercise techniques to help prevent recurrences of the pain and injury. 3)ACUPUNCTURE: Acupuncture is a time-honored treatment that enhances the body’s ability to heal itself. It is based on the knowledge that the body is a complex bioelectric system in which energy flows through well-defined paths. 4)CHIROPRACTIC TREATMENT: Experienced chiropractors correct disorders through effective manipulation. Chiropractic treatment is a very well known therapy for arthritis, pain and injury. It restores normal function by correcting imbalances of the spine, joints and muscles. 5)NUTRITIONAL GUIDANCE: Joints, nerves and muscles are made of living tissues, therefore, daily use causes “wear-and-tear” on them. Adequate nutrition is needed to prevent the damaging effects of free-radicals and to avoid the harmful effects of acid forming foods and “anti-nutrients”. We emphasize and teach the JUPITER INSTITUTE OMEGA DIET to decrease inflammation and pain. 6)SUPPLEMENTS: The average diet is missing essential nutrients that can be replaced by taking supplements. We counsel our patients on appropriate dosages and preferred brands of vitamins and supplement including Glucosamine, antioxidants and omega fatty acids. 7)EXERCISE INSTRUCTION: Since exercise is often an important part of the healing process, our team counsels patients on the right types of exercise. All team members may be involved in this instruction. 8)HORMONAL BALANCE: We show our patients how imbalances in thyroid and hormones, magnify pain and suffering: and we assist them in correcting those disorders. 9)METABOLIC IMPROVEMENT: We show our patients how imbalances in metabolism, magnify pain and suffering: and we assist them in correcting those disorders. We also instruct our patients about the benefits of consulting orthopedic doctor, rheumatolgist and/or/ neurologist when conditions require. NOT ALL PATIENTS REQUIRE ALL THE TREATMENT WE OFFER: as different conditions require different treatments, our flexible programs provide the combined treatment that is best for each individual. Recommended treatment plans differ in length and composition from patient to patient.